How much do Raptors suites cost? 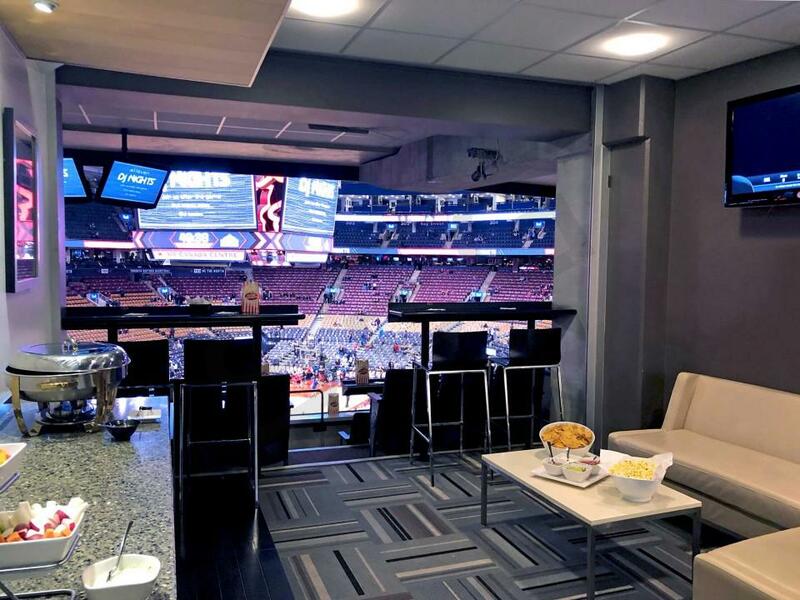 Toronto Raptors luxury suites will range in price from $4,500-$10,000 (USD) depending on opponent, day of the week, and suite level/size/location. Weekday games and popular opponents will be priced at a premium. In general, Raptors suites are more affordable than Maple Leafs suites. 200-Level Executive Suites are located on a private suite concourse at the top of the lower bowl (30 rows off the floor). The Executive Suites (64 in total) wrap around the arena. These suites can accommodate groups of 12-20. Suite amenities include multiple HDTVs, an in-suite bar/kitchenette, and access to VIP Entrances and restaurants/clubs on the suite concourse. Loge Suites are located on the 400-Level on the West End of the arena behind the opponents net. Loge Suites feature 8 stadium-style seats on a private balcony in addition to barstool and lounge seating throughout the suite. Loge Suites provide early stadium access and use of the VIP Entrance. Theatre Suites are located one side (East) of the 500 & 600 levels of Scotiabank Arena. Theatre Suites provide a great birds-eye view of the game/event below. These suites are perfect for smaller groups, numbering 8-14. Suite amenities include HDTVs, premium balcony seating, interior lounge seating and kitchenette with plenty of counter space. Scotiabank Arena suites vary in size and seating configuration. Most suites will accommodate 12-20 guests. Executive Suites (200-Level) and Loge Suites (400-Level) typically feature 12 stadium-style seats on a private open air balcony in addition to barstool seating at high top tables in the suite. Theatre Suites, located on the 500- and 600-Level, are best for smaller groups. Theatre Suites comfortably accommodate 8-12 guests. Private suite rentals at Scotiabank Arena will typically cost $4,500-$18,000 depending on event. 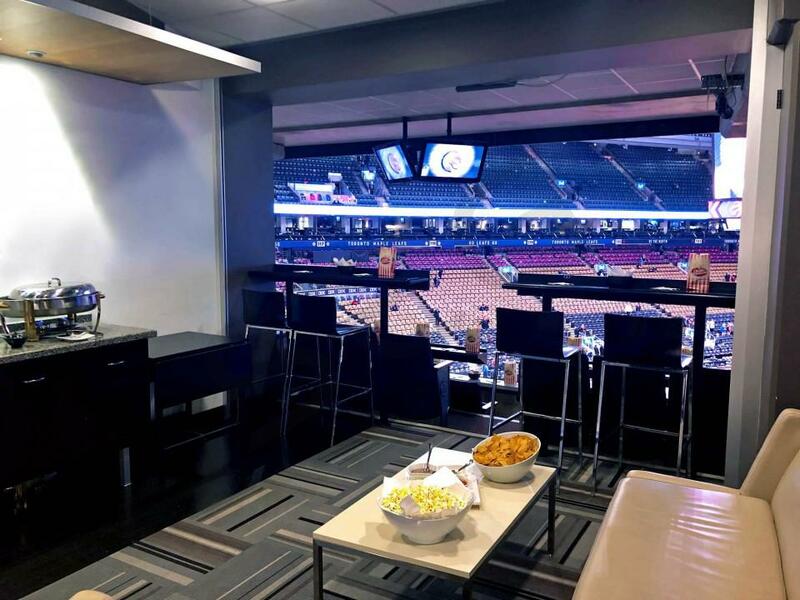 Toronto Maple Leafs (NHL) suite rentals suites cost between $6,000-$18,000 while Toronto Raptors (NBA) suite rentals cost between $4,500-$12,000 (all prices in USD). 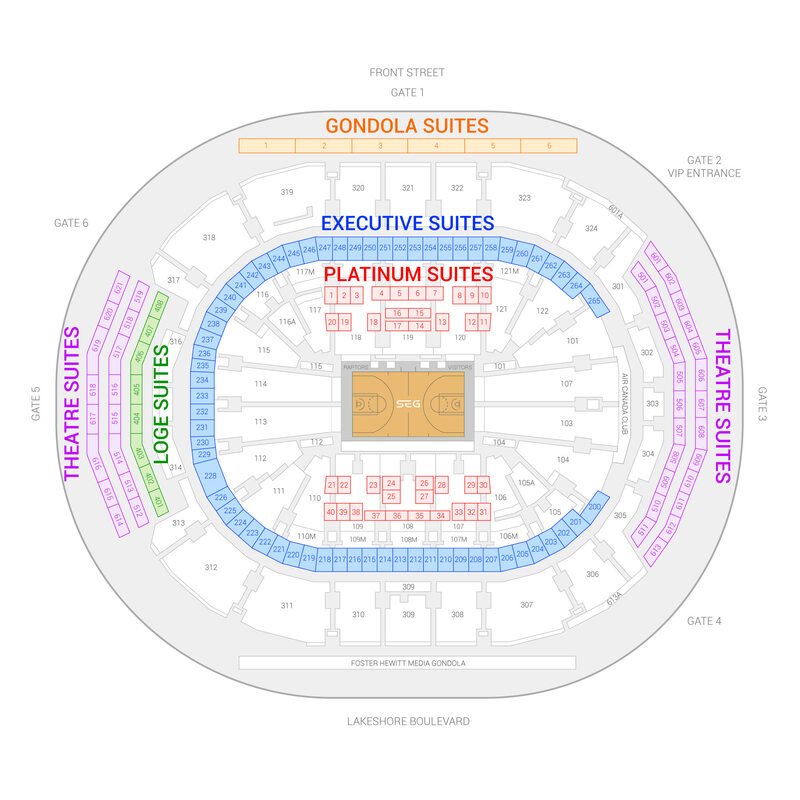 Suite pricing will vary based on opponent, suite level, suite size and suite location. In-suite catering at Scotiabank Arena is provided by Pinnacle Caterers. Most suite rentals are pre-stocked with beverages (soft drinks, beer, wine). Beverages are priced on consumption. Food is available to preorder in advance of your event. Alternatively, you can order food from your suite during the event. On average, SEG clients spend ~$100 (USD) per person on a full catering spread. However, there is no required minimum spend. Children under the age of 2 do not require a ticket to enter Scotiabank Arena. There is no required dress code for luxury suites at Scotiabank Arena. Corporate groups will typically be dressed in business casual attire; however, you will see many patrons in casual/leisure attire. Scotiabank Arena is located at 40 Bay St. in Downtown Toronto, Ontario. Union Station, located underneath the arena, connects Scotiabank Arena with all major public transit systems. Scotiabank Arena has 2 levels of private underground parking reserved for suite and club parking passholders. Underground public parking is located at 15 York Street; this lot provides indoor (covered) access to Maple Leaf Square, the Real Sport Bar & Grill, and Scotiabank Arena. Parking rates will vary between $15-$45 depending on lot. VIP Entrances open 2 hours prior to the start of basketball and hockey games and 1 hour prior to concerts. Depending on your suite level, there are different entry points which will be listed on your ticket. The new-look Toronto Raptors will look to take the next step in 2018-19, hoping to get over the hump and make a deep playoff run. The Raptors led the East with 59 wins last year, but their season fell short with a familiar ending - losing to LeBron James in the playoffs. Even with LeBron James moving to the Western Conference, the Raptors shook up their roster to add more firepower on the court and on the sidelines. In a trade that shocked the rest of the NBA world, the Toronto Raptors acquired 2x Defensive Player of the Year Kawhi Leonard from the San Antonio Spurs. In exchange for Leonard and sharpshooter Danny Green, the Raptors parted ways with franchise cornerstone DeMar DeRozan, as well as Jakob Poeltl and a first round pick. With his smooth scoring ability and elite defense, Leonard is undoubtedly one of the best players in the league when healthy. Despite mixed reviews following the trade, upgrading from DeMar Derozan to Kawhi Leonard should pay off in a big way for the Raptors this season. With Leonard’s upcoming free agency next summer, every Raptors home game will be another crucial step towards convincing Leonard that Toronto is his home for the future. There will be no shortage of drama up north this year. Before the Raptors shook up the roster by trading for Kawhi Leonard, the team replaced Dwane Case with Nick Nurse as head coach. Nurse was previously an assistant coach with the Raptors since 2013. With high expectations, Nurse will need to turn this team into a legitimate championship contender from day one, in additional to playing a major role in the year-long recruitment effort of Kawhi Leonard. Kawhi Leonard and his former Spurs teammate Danny Green are both penciled in to start, along with Kyle Lowry, Serge Ibaka, and Jonas Valanciunas. Kyle Lowry has been an All-Star four straight seasons, a streak he will look to continue in 2018-19. His elite shooting and playmaking make him one of the premier point guards in the NBA. With the additions of Kawhi Leonard and Danny Green on the perimeter, Lowry should have more room to operate and create plays in the paint. Sixth Man of the Year candidate Fred VanVleet quickly became a fan favorite last season, and he should play a major role once again this season. Enjoy Toronto Raptors basketball in The Six all year long at the newly re-named Scotiabank Arena. Toronto Raptors luxury suites include HDTVs, upscale furnishings, deluxe catering, and excellent views of the floor. Maybe Drake will even take a night off from his courtside seats and watch the game from a suite near yours! The Toronto Raptors have quietly established themselves as one of the elite teams in the NBA’s Eastern Conference. Coming off their fourth straight playoff berth, the Raptors will look to advance past the conference semifinals in 2018. The Raptors are lead by All-Stars DeMar DeRozan and Kyle Lowry. DeRozan and Lowry provide a formidable 1-2 punch; DeRozan is an excellent slasher and mid-range player while Lowry runs the point and is a lethal outside shooter. The Raptors have surrounded DeRozan and Lowry with capable NBA veterans like Serge Ibaka, Delon Wright and Jonas Valanciunas. The Raptors are an experienced playoff team and don’t be surprised if 2018 is the year that Toronto finally crashes into the NBA Finals. 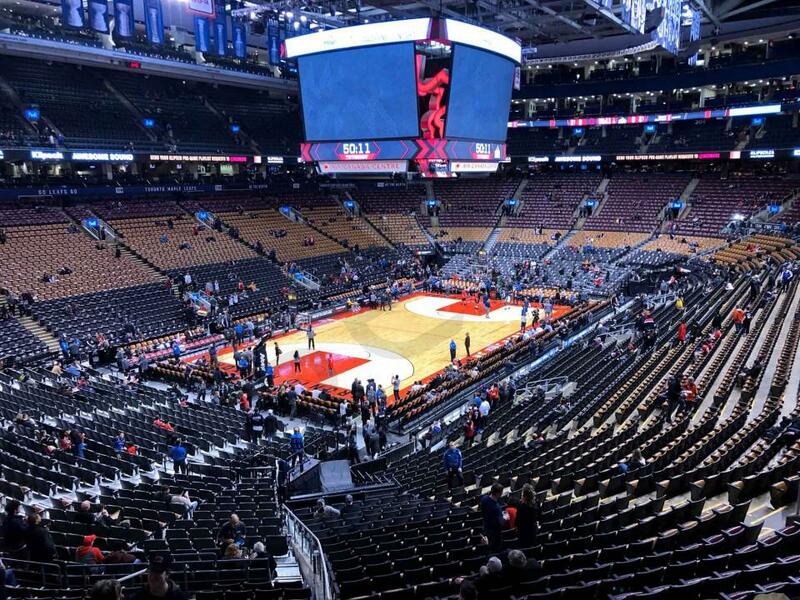 The Air Canada Centre is an exciting venue to watch the NBA. Toronto Raptors suites can accommodate 12-24 people depending on suite level. Inside ACC suites, guests will have Wi-Fi, HDTVs, comfortable lounge seating (both inside and outside of the suite) along with a dedicated suite attendant. Premium in-suite catering can be purchased. In 2015, the Toronto Raptors finished as the second seed in the Eastern Conference with a record of 56 wins and 26 losses. In the playoffs, the Raptors were a force to be reckoned with beating the Pacers and then the Heat before being ousted by the Cavaliers. The Raptors are back with championship aspirations once again this year and they just might have the talent to do it. Their top two players are back and locked in for a long time after DeMar DeRozan signed a five-year $139 million dollar deal in the offseason. DeRozan had a great year in 2015 he was named to the All-Star game for the second straight season and scored over twenty points per game for the third year in a row. The second star of the Raptors two-headed attack is point guard Kyle Lowry. Lowry had a career year last season finishing with career highs of 21.2 points per game, 4.7 rebounds per game, 6.4 assists per game and 2.1 steals per game. Both stars played in the Olympics for Team USA and fresh off an Olympic gold medal they seem primed to take the next jump to become NBA champions. Other vital pieces of Toronto’s core are center Jonas Valunciunas and forward DeMarre Carroll. The big Lithuanian center, Valunciunas, has shown the ability to dominate yet lacked the consistent production that the Raptors have been hoping for while DeMarre Carroll was injured for most of the season last year. If Valunciunas and Carroll play like they have shown they can, this should be one of the most exciting teams in the NBA. In the offseason, the Raptors acquired Jared Sullinger, Pascal Siakam, and Jakob Poeltl. Sullinger, the former Ohio State star, is a player that the Raptors are hoping can fill the starting forward spot for years to come. Siakam is a Cameroonian center who is very athletic, can block shots and finish around the rim. Poeltl is a huge Austrian center who is a defensive monster and a skilled operator from the post. If the youngsters develop the way the Raptors would like and their two All-Stars continue to dominate, this Toronto team could win it all. The Air Canada Centre is an exciting venue to watch the NBA. Most Raptors suites will accommodate groups of 20 people. Inside a suite guests will have Wi-Fi, HDTVs, entertaining space, balcony seating and a suite attendant. In-suite catering can be purchased in advance. Along with a Raptors suite, you will receive VIP parking passes. Guests with a suite ticket will also enter the Air Canada Centre through a private VIP entrance. The Air Canada Centre will also be hosting Adele, Drake and Future Concert Tours. Thank you for signing up for specials at Scotiabank Arena. Enter your email address below to stay in touch. We'll sign you up for our newsletter, which will inform you of the latest inventory and events at Scotiabank Arena. We promise we will never sell or distribute your information. The seating chart below shows where the Toronto Raptors suites at Scotiabank Arena are located.